Got a bunch of cukes from the garden this week so I decided to try my luck at pickles! After quality time wasted searching the net I found a fairly simple recipe (which I neglected to write down). And the process began! I sliced the cukes and onion and sprinkled salt over them as I layered them in a bowl and let them sit overnight. Then they had to be drained and rinsed. Pardon the stove mess, cooking is messy business! After that I boiled 1 & ½ cups of apple cider vinegar, 1 & ½ tablespoons mustard seed, 1 teaspoon celery seed, and ½ teaspoon turmeric (you may need more or less depending on how many cukes you have). Then I added the cukes and onion to cook for about 3 minutes. Scooped out the pickles into canning jars and boiled them for 10 minutes to seal them and here they are in all their canned glory! Now I just have to wait two weeks for the flavors to mingle and we will see if they taste as good as they look! And now I need to make some and making some for me means I need to start growing my own herbs. There the problem begins because I have cats, cats that eat anything I try to grow, so I would love suggestions for growing herbs indoors that are cat proof! I got my hair done at a place a while ago that had cucumber water. It was so GOOD! You could try that next time you have extra cukes. Just add them to water and let sit. Thanks for the suggestion! 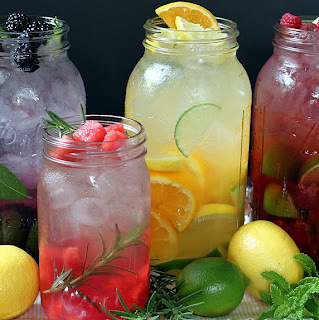 I actually hate the taste of water (or maybe it's lack of taste) so I love ideas to give it flavor!